Artificial turf (also referred to as "fake grass" or "synthetic turf grass") is an excellent alternative to live sod or turf as it gives the appearance of a healthy, well-maintained lawn without the associated maintenance and cost. It also significantly reduces water usage, which can help Orange County residents comply with water-use reductions that are currently mandated by the state of California. As an added bonus, by investing in turf replacement, you can also take advantage of sizeable rebates by your local water district. At D F Landscape, we have been providing homes and businesses in Orange County with drought-tolerant landscaping solutions for over 30 years. 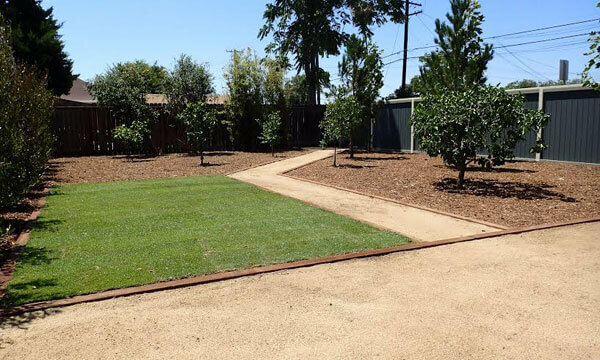 In addition to California native plants, direct drip irrigation, sprinkler upgrades, and organic mulch, we also offer an array of synthetic turf options. We'll help you maximize your water savings and turf replacement rebate, while ensuring you get a look that complements your property as well as meets your aesthetic preferences and functional goals. Call D F Landscape today for all of your artificial grass installation and replacement needs in Orange County. We'll begin with a free, on-site estimate and then provide you with an upfront price quote prior to beginning work. Once approved, we will take your schedule into account and work hard to install your artificial grass in as timely a manner as possible. Plus, once the job is complete, we'll help you complete all the rebate paperwork.